Heel pain may respond to treatment with over-the-counter medications such as acetaminophen (Tylenol), ibuprofen (Advil), or naproxen (Aleve). In many cases, a functional orthotic device can correct the causes of heel and arch pain such as biomechanical imbalances. In some cases, injection with a corticosteroid may be done to relieve inflammation in the area. Pre-surgical tests or exams are required to identify optimal candidates, and it's important to observe post-surgical recommendations concerning rest, ice, compression, elevation of the foot, and when to place weight on the operated foot. In some cases, it may be necessary for patients to use bandages, splints, casts, surgical shoes, crutches, or canes after surgery. Possible complications of heel surgery include nerve pain, recurrent heel pain, permanent numbness of the area, infection, and scarring. In addition, with plantar fascia release, there is risk of instability, foot cramps, stress fracture, and tendinitis. 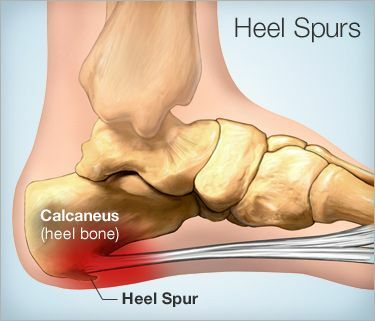 You can prevent heel spurs by wearing well-fitting shoes with shock-absorbent soles, rigid shanks, and supportive heel counters; choosing appropriate shoes for each physical activity; warming up and doing stretching exercises before each activity; and pacing yourself during the activities. Avoid wearing shoes with excessive wear on the heels and soles. If you are overweight, losing weight may also help prevent heel spurs. American Podiatric Medical Association: "Heel Pain," "General Foot Health." American Academy of Podiatric Sports Medicine: "Running and Your Feet." American Podiatric Medical Association: "Rearfoot Surgery." FamilyDoctor.org: "Plantar Fasciitis: "A Common Cause of Heel Pain." Green, D. Podiatry Today, May 2006.